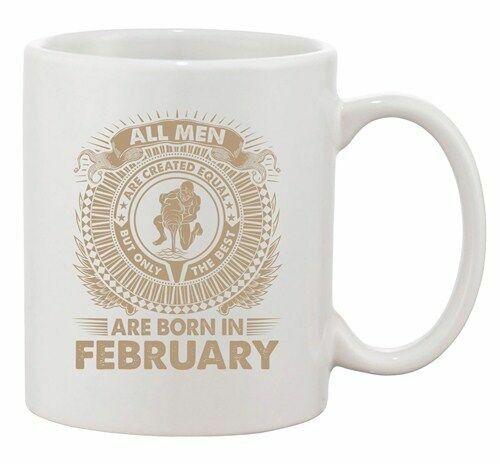 All Men Are Created Equal But Only The Best Are Born In February Funny Dishwasher Safe Coffee Mugs. Support Novelty Glassware, high quality ceramic coffee cups only from City Shirts. Our 100% satisfied 7-day money back guarantee is this. We want you to be 100% happy with your purchase. And we are so sure that you will be, that we offer a no questions asked money back guarantee. And our guarantee is valid for 14 days from the date of receipt. If for any reason your are not fully satisfied with any products you purchased from us, simply return them to us within 7 days from the date of receipt, to receive a full refund or exchange minus shipping charges. We only accept returns or exchange for new, unused and unworn items. Any returns not meeting these guidelines will be returned to the costumers without a refund. Shipping fees on all orders are non-refundable. Thank you in advance for giving us the chance to become your preferred and trusted seller for all your mugs needs! You should know that we've been proudly serving our valued and loyal customers for many years! Over so many years we've kept our philosophy simple: Offer Great Mugs, at Great Prices, with Excellent Customer Service, Everyday! If for any reason you are not happy with your order, please contact us and give us a chance to make it right. Still not convinced? Just check out our near perfect feedback!